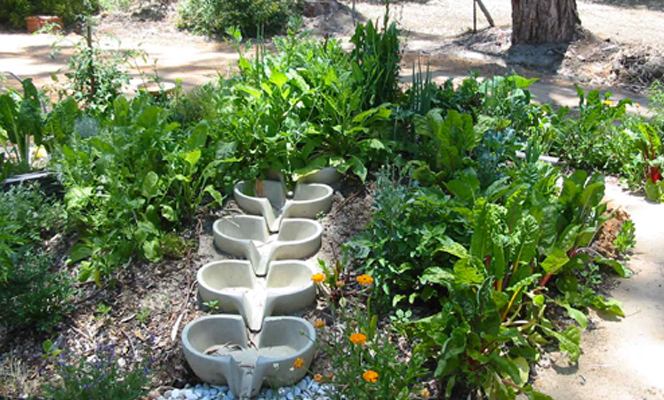 Permaculture uses the simple designs and principles in nature and applies them in garden areas. This becomes evident in the shapes of the garden beds, the importance given to water in the environment and areas where recycling of organic matter occurs. Permaculture-designed gardens are a very useful teaching tool. They only become effective when teachers use them as part of the curriculum and integrate lessons with hands-on garden activities, such as building, planting, mulching, monitoring, harvesting, composting and recycling. These types of gardens quickly fall into disrepair when they are neglected. Permaculture gardens become an important link with the larger environmental areas outside of the school grounds. 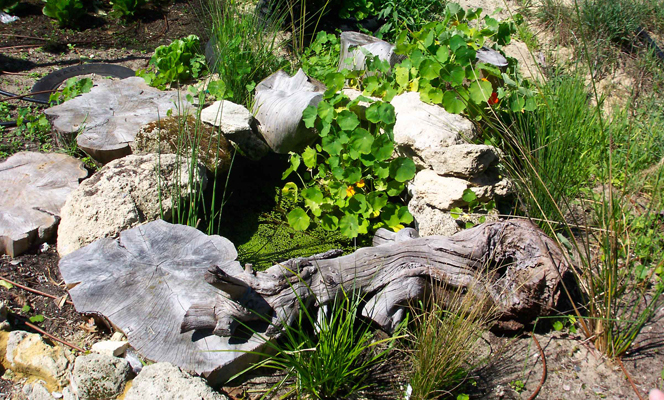 Students can keep small plants and animals in ponds and pens and build mini ecosystems – all of which reflect the kinds of things which happen in the larger, natural ecosystems. Permaculture-designed gardens in schools are most often a result of the practical component of a Permaculture Design Course (PDC). These courses, which are internationally recognised by Permaculture organisations, are run by professional Permaculture teachers. The PDC is a minimum of 72 hours or about two weeks full-time instruction. Part-time courses are occasionally available. An important component of this course is the practical design and implementation of a garden area. In many cases, non-profit organisations, such as schools, are chosen. There is a rapidly growing number of primary and secondary schools, both public and private, that are developing Permaculture-designed gardens and incorporating Permaculture principles in their curricula. Schools and teachers can find out more about this aspect by contacting their local Permaculture Association or group. At other times, individual parents or community members can be involved in designing and building garden areas in the school. Costs for these services, if any, are negotiated between the school and the person concerned. These people must be qualified and hold a Permaculture Design Course Certificate. The word Permaculture was first coined by Bill Mollison and is copyright. Its copyright is vested in the Permaculture Institutes and their College of Graduates throughout the world and guarded by them for the purposes of consistent education. The word permaculture can be used by anybody adhering to the ethics and principles expressed in the various books written by Mollison and others. The only restriction on use is that of teaching; only graduates of the Permaculture Design Course can teach permaculture and they adhere to agreed-on curricula developed by the College of Graduates of the Institutes of Permaculture. Access for the course group to assess the site, discuss with the Principal, key staff and/or gardener the plans and concepts for the area. Availability of an area which can be set up to be maintained, with supplies of water and other materials, such as mulch, compost and future plantings. At least one member of the school staff to undertake a Permaculture Design Course – either as part of the design process for the school area or at some earlier stage. The cost for such a course is about $1000. Funding for plants and materials for part of the implementation. Nominally, this is about $1000-2000 which usually includes mulch, compost, trees and shrubs, irrigation, and borders and paths. Usually, some materials can be expected to be donated by parents, course members and commercial establishments. Some organic material is often available on site – from lawn mowing the school grounds or compost and mulch obtained or made by the school gardener. A continuous supply of organic matter is crucial to the future development and success of the garden areas. During the implementation stage of a PDC only some parts of the garden area are built. It cannot be over-emphasised the important role of ownership in the gardens and the need for students to be involved in the planting and setting-up stages. This may mean inviting students on a weekend to help build the initial gardens or removing them from class for that day. Students have to be responsible, with teacher direction, to maintain the garden beds in tasks such as weeding, picking off slugs and snails and removing dead leaves for the compost heap. They need to be given areas for their own individual or group garden beds and they should feel involved in the development of the site. It is envisaged that the school and staff continue to develop and maintain, with the help of the children, the whole area of the design over the years that follow. Some support by local Permaculture practitioners and Permaculture Associations can be expected upon request to them. These organisations often encourage schools to become members of their Association so that they can receive any newsletters and other benefits, such as seeds, loans of videos and books, and information about Permaculture activities in their state or country. In most schools, Permaculture is taught as part of the existing curriculum of subjects such as Environmental Education, Science, Horticulture or Social Studies (Studies of the Environment and Society). Some schools teach Permaculture in its own right and award students with Introduction to Permaculture Certificates and even Permaculture Design Course Certificates if students have themselves undertaken the 72 hour PDC during their school year. Developing a thematic approach to learning also gives some direction for students. They start to see that a subject is not just a series of small units, but it can be integrated to cover many aspects of their lives and their surroundings. The challenge for teachers is to develop strategies to cover a particular course. Building an outside classroom takes time, school and department support, and money. Here are some guidelines to help you get started. This is the first step in developing an outside classroom. It is also the most important and should involve consultation with all the stakeholders for the area. In working with children and schools you need to determine: the needs and wants of the children, teachers and the school. what the budget is (how much you can spend). how much time and energy is available to implement, maintain and develop the garden area. what resources are available – both on site and in the local community. the potential site – its limitations, existing structures and positive qualities. To determine the needs of a school, the budget and level of support in the community, you really need to discuss your ideas with a wide number of people, some of whom will include the teachers who want to use the area, school principal, other school staff, the gardener, and members of the school council and/or the parents and citizens (or parents and friends) association. Involve children as much as you can. Teach them about design. Get them to measure the area and do scale drawings. Ask for their input and ideas. It may not be possible for the students to come up with a fully-functioning design, but unless they have some ownership, along with the teacher, of the plan, the future success of the garden area is not guaranteed. Children get excited and willing to work when they know that what they are doing is something they have contributed to. You may be surprised at the number of really good (and innovative) suggestions they make about the garden and site development. Lead them gently through the process. Consider the ages of the children. Small areas are great for small children, not so good for teenagers. Garden beds may have to be smaller than usual so that children can access all areas easily. Children like their own garden beds. Groups of two or three work well together and can easily build, plant and look after their beds. Individuals should be allowed to develop their own garden if they ask, but encourage group co-operation. Remember that we are trying to teach life skills and community values, as well as gardening. Sometimes different classes want a part of the garden. It may be better to consider building small garden areas nearby each classroom, rather than one larger area away from the school. Smaller gardens, solely the responsibility of one class and one teacher, are more intimate for the children. Alternatively, allocate different areas in the larger garden for those classes and teachers that do want their own space. Will other groups of people, besides those directly building and maintaining the garden, be using the area? How can you use other teachers and their classes in the garden? Can you ask the art department to get their students to design and make clay-fired bird-baths? Do they want to display some of their sculptures in the garden? Will manual arts help build the seats you want to put in the area? Do any science teachers want to set up and stock a pond? If you involve everyone, then everyone will own the garden. Will the produce from the garden be sold, taken home or given away? Is the school canteen willing to buy foodstuffs from the students? What kinds of foods would the canteen want? Gardening gives a direct connection to our food source. Many students initially fail to see the connection of what they are growing to the food they eat at home. Some garden beds could contain plants for propagation work. These stock garden beds may be small beds of particular herbs that are used for cuttings and grafting work. Beds could have different themes. For example, one bed for culinary herbs, another for medicinal herbs and another for pest repellent herbs. All students could then take small pieces of these plants from the stock beds for their own use. Outside activities should be organised and related to the curriculum. Many educational objectives and outcomes can be covered by simple, fun-to-do activities in your new outside classroom. Other types of activities lend themselves to schools. 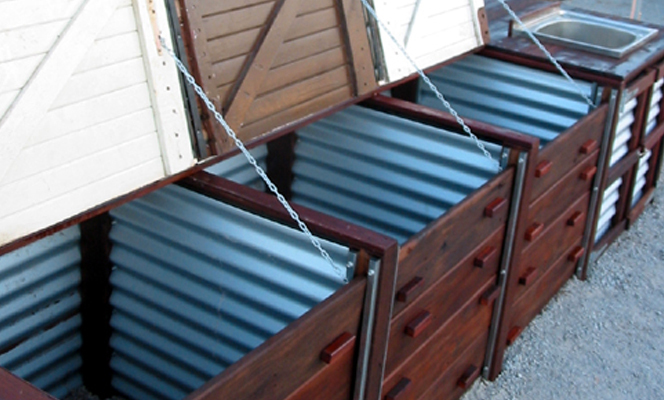 For example, nesting boxes for birds, possums and bats could be studied by science students. Place one or two bird baths and/or feeding trays in the garden – you’ll be surprised what you will attract. Build a weather station that holds equipment which measures daily temperature and barometer changes, humidity, rainfall and wind direction and speed. In some circumstances the school garden could become the community garden. Parents and community members could help students with garden development and/or be responsible for areas themselves. They may grow things to take home or for use by the school. There is a general push by governments and education authorities to better use schools as this valuable resource is under-utilised at present. Community gardens are one way to ensure a win-win situation. It also helps alleviate some of the potential vandal problems which may occur. The skills that children learn help build their self-esteem as they realise that they have the ability to grow things and that they have a role to play as part of a co-operative team – a role that they learn at school which they continue to develop throughout their life as part of the local community. Plan for open space. You have to get at least one class in the garden area at any one time. This could be up to thirty students – where are you going to put them all? Main pathways have to be wide. It is not practical to have the half-a-metre path that you have at home in the school garden area. Secret or quiet places are important. Children like to hide, especially from teachers, and secret garden areas provide sanctuary. Seating is essential. Simple log or bench seats are more than satisfactory, but rock or carved seats can really look great. Plan for some garden areas to be shaded. This could mean placing some of the seats under large trees or using structures like walkways, vines and pergolas. Developing your own shrub and tree nursery will help in reducing costs of obtaining plant stock for the garden. This can be as simple as a potting area, small shade-house (covered frame) or a series of benches in a hothouse for plant propagation. Developing an outside classroom, where students can both learn and enjoy, is a sensible way in which educators can effectively teach the “curriculum”. Some students only seem to learn by working outside in the garden or doing practical activities. Others thrive in the more academic sphere. All students, however, need stimulating lessons to hold their interest. What better way is there than to go outside and observe and learn from nature? Mars, R. (1996). The Basics of Permaculture Design. Candlelight Trust. Perth. has a chapter on permaculture in schools. Mars, R. and J. (1998). Getting Started in Permaculture. Candlelight Trust. Perth. Revised from 1994 edition. Contains heaps of practical activities for school children. Mars, R. (Ed). (2002). Permaculture Volume 2 – the Best of PAWA. Selected articles from the Newsletters of the Permaculture Association of Western Australia. A easy-to-read, useful reference book about basics, techniques, and plants and animals in permaculture systems. Good information for student assignments. Shanahan, L. (2010). Eat Your Garden. – organic gardening for home and schools. PI Productions. Qld. Good colour photographs of activities and lots o useful information for teachers. Nuttall, C. and Millington, J. (2008). Outdoor Classrooms – a handbook for school gardens. PI Productions. Qld. Practical, well-illustrated, full of activities with curriculum links.